Lisnagelvin Primary school celebrates the 40th anniversary of its official opening today (Wednesday). The Waterside school was opened by the Secretary of State for Northern Ireland, Roy Mason, following the merger of Clooney and Rossdowney Primary Schools back in 1978. In fact, the school was the first to be provided by the Western Education and Library Board at that time. The initial enrolment was 500, however, this has steadily grown to 591 pupils currently recorded on the school register. The first principal was Mr Robert Henderson and vice-principal, Mr Bill Charles. At that time, Mr Bertie Faulkner was chairman of the school management committee. Mr Henderson remained principal of the school for four years, followed by Mr Hugh Lyndsey taking up this role in 1982. Then, in 1986, Mr William McIlwaine became principal. The school currently is under the direction of Mr Colin Torrens, having been in post since 2009. The new school was officially opened in 2011 by Rev. Robert Herron, chairman of the Western Education Library Board. The school enjoys a reputation for high academic standards, achieved within an environment where each child is valued. Many of the teachers have been at the school for decades. Mrs Doherty who is currently SENCO (Special Educational Needs Co-ordinator), has been teaching in the school for 32 years. She highlighted how the school community has stretched and deepened, evidenced in the range of pupils currently enrolled in the school, originating from many parts of the world, as well as pupils from both communities within the locality. Although the school building is very large, the staff say they pride themselves on knowing pupils on a personal level, nurturing them through quality pastoral support networks. 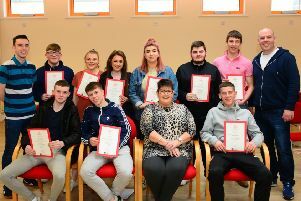 Miss Royle, a teacher in Lisnagelvin Primary School for 37 years, said the school has always been known for its child-centred approach to education, having a strong emphasis on building partnerships with parents and the wider community. She said: “We are a family-oriented school, without a doubt. Our desire is to see develop the whole child – teaching them life skills to equip them to take their place in society.” When the school originally opened, a small number of after-school clubs were available, such as netball, football and Scripture Union. However, over the years, the range of extra-curricular clubs has extended within the school, providing language clubs, music, drama, sporting activities and ICT. These clubs provide our pupils with an opportunity to develop new skills and interests. The school prides itself on ‘wraparound care,’ with the aim of providing support for parents, many of whom work long hours. It all starts at 8am with Breakfast Club and beyond the school day, and offers Activity or Homework Club up until 5pm. “Our aim at Lisnagelvin Primary School, is to support parents. Having our own minibus, pupils can safely be transported to and from school within the local neighbourhood, and this is a great support for many parents, too,” added Miss Royle. Today (Wednesday) sees the official launch of celebrations marking the school’s 40th birthday. Mrs Hughes’ Primary 5 class will perform at the special event with many special guests, governors, past pupils and staff attending. Those present will also enjoy a photographic display and experience - shared memoirs of Lisnagelvin Primary School over the last 40 years, followed by refreshments. It will be a trip down memory lane for many people, without a doubt. Some past pupils of Lisnagelvin are currently part of the current staff team at the school. Mrs Caskey, a past pupil of the 80s, followed in her mother’s footsteps (Mrs Elizabeth Charlesson), training as a teacher, and then returning to Lisnagelvin in 2002. Both Mrs Charlesson and Mrs Caskey taught together in the school for three years before Mrs Charlesson retired in 2005. Now, Mrs Caskey’s two boys attend the school. Several other current staff members also have their children at school with them. Mrs Rebecca O’Hara who is teaching Primary One is delighted to have her son, Matthew come to school with her every day. Mrs Cheryl Smith and Miss Diane McGowan, both classroom assistants, shared their enjoyment of the school as a pupil, and then, coming back to work in the school some years later. They continue to be part of the school team, and both ladies have continued the tradition in having their children attend the school. The school will be organising other events and activities to mark the special anniversary, over the coming months. Looking towards the future, staff at Lisnagelvin Primary School say the school aspires to provide all its pupils with skills and attributes to enable them to be life-long learners, and that they look forward to seeing many pupils maintain contact with the school over the next decade as it focuses on the 50th celebrations in 2028!